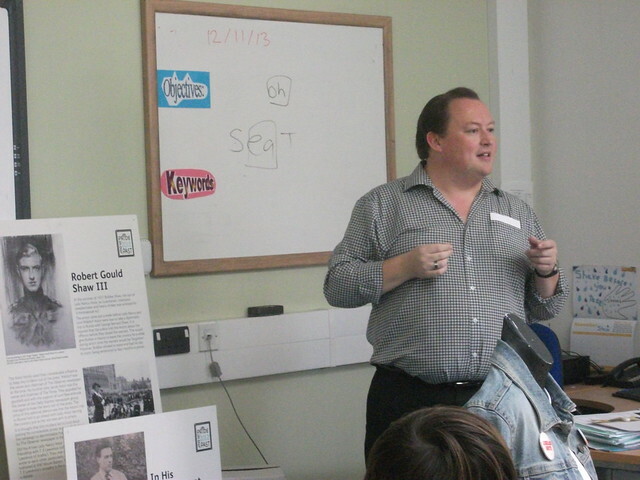 Alan Butler presenting the LGBT Archive to pupils at Brook Green Centre for Learning. Brook Green Centre for Learning, a set on Flickr. On Thursday 14th November, Alan Butler visiting Brook Green Centre for Learning weighed down with a sizeable group of items from the Plymouth LGBT Archive. Fortunately, three of the young people he was there to visit met him at the door and help him down to the class room. In the hour the followed, Alan talked to the young people about some of the history surrounding LGBT communities and, in particular, the history had been played out for the people of Plymouth. The group were surprised how much LGBT history existed in the city and they were particularly surprised to learn how recently the many laws had changed in this regard. 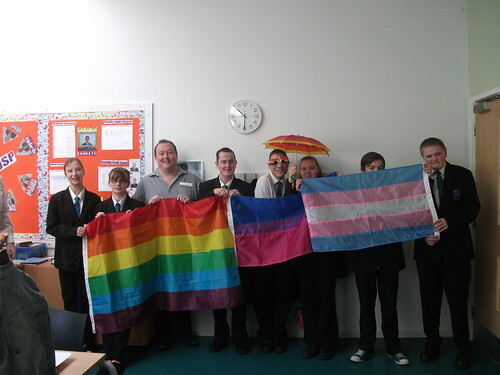 They were interested to learn about the history of the Gay Pride Flag and also the Bisexual and Transgender flags . . . although favourite items were still the rainbow sunglasses and the rainbow umbrella – which comes with a particularly handy whistle which is useful in a parade but also in a quiet classroom. Both items were modeled by several people in the class, including the teacher! The group discussed how important representation of LGBT people in Plymouth and how important it was to share this kind of often hidden history so Alan was delighted to offered the chance to visit Brook Green again in the near future. If you’re interested in having the archive visit your school or youth group please contact us. 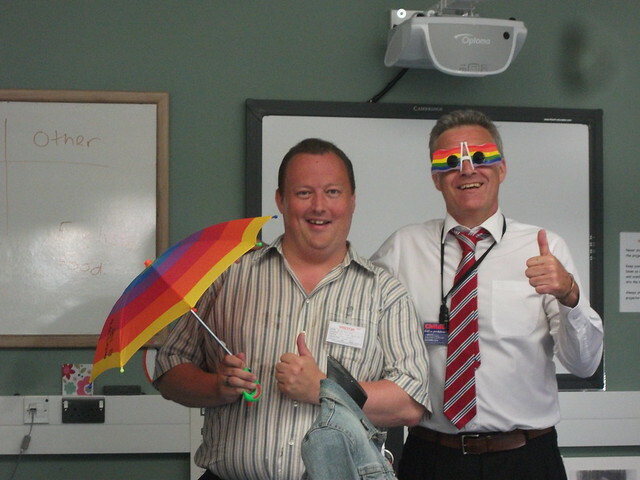 Alan Butler from the Plymouth LGBT Archive with teacher Jon Spree at Brook Green Center for Learning.